A new 3D printer and a little something special later in the day. It's Friday! Welcome back, folks! As always we are glad to see you here to check out these sweet new products. Today we start with a brand new 3D printer from LulzBot® that we released early this week, as well as a second new product that you will have to wait until 11 a.m. MST to see. This is your Friday Product Post, so let's dive in and check it out! New 3D printers are always a great cause for excitement! 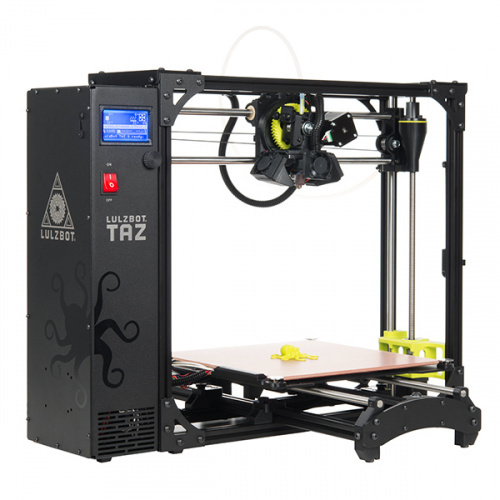 The LulzBot TAZ 6 is the most reliable, easiest-to-use desktop 3D printer ever, featuring innovative self-leveling and self-cleaning, and a modular tool head design for flexible and multimaterial upgrades. This 3D printer is able to facilitate more consistent, higher-quality prints than ever. The TAZ 6 now features a fully integrated power supply and an updated extruder capable of supporting even more filament options. The SparkFun Inventor's Kit for Google's Science Journal App is an interactive selection of tools to inspire future scientists and makers. Inside each kit you will find a collection of parts from us here at SparkFun that support activities developed by Google and the Exploratorium in San Francisco. Beginning with a project to build your very own Wind Spinner, new projects will be released periodically that utilize the supplies in this kit and Google’s Science Journal App. The next activity will be released this summer! That's it for this week, ladies and gentlemen. As always, we will be back next Friday with even more new products that fill any need you might have. See you then!